(Newser) – Former French President Nicolas Sarkozy was placed in custody on Tuesday over allegations he received millions of dollars in illegal financing from the regime of the late Libyan leader Moammar Gadhafi. A judicial source with direct knowledge of the case tells the AP that Sarkozy is being held at the Nanterre police station, west of Paris. Sarkozy and his former chief of staff have denied wrongdoing in the case, which involves funding for his winning 2007 presidential campaign. Though an investigation has been underway since 2013, the case gained traction some three years later when French-Lebanese businessman Ziad Takieddine told the online investigative site Mediapart that he delivered suitcases from Libya containing $6.2 million worth of euros to Sarkozy and his former chief of staff, Claude Gueant. 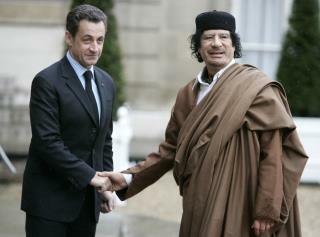 Investigators are examining claims that Gadhafi's regime secretly gave Sarkozy 10 times that amount overall for the 2007 campaign. Such a sum would be more than double the legal campaign funding limit at the time. In addition, the alleged payments would violate French rules against foreign financing and declaring the source of campaign funds. In the Mediapart interview published in November 2016, Takieddine said he was given the cash in Tripoli by Gadhafi's intelligence chief on trips in late 2006 and 2007 and that he gave the money in suitcases full of cash to Sarkozy and Gueant on three occasions. He said the handovers took place in the Interior Ministry, while Sarkozy was interior minister. Takieddine has for years been embroiled in his own problems with French justice; the AP has more on that and on Sarkozy's complex relationship with Gadhafi here. Racist French folks guided by a French taking money from a rich foriegner. Classic globalism. I always liked Gadhafi. As long as he was alive I wasn't the ugliest man in the world.